Impact Technology is a unique and innovative compaction and pavement breaking technology developed in the end of 20th century. It is unparalleled in its high production capacity by any other compaction or breaking methods. 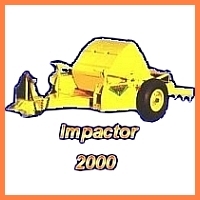 Compaction and breaking are performed by the Impactor 2000’s unique 9,5 t, cam shaped drum. 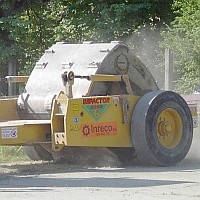 The induced rolling of the drum, resulting from the forward movement of the pulling unit, develops all energy required for compaction or breaking. Due to its unique working principle, the energy gained from the rolling action is doubled by a trigger mechanism, thus the high impact energy yielded. At its optimum operating speed of 12-15 km/h, the drum delivers 2 blows per second to the underlying surface.